Synthetic peptide within Human SOX2. The exact sequence is proprietary. WB: NCCIT, F9, MCF-7 and C6 cell lysates; Human glioma lysate. IHC-P: Human gliocytoma, breast carcinoma, fetal stomach, fetal lung and embryonal carcinoma tissues; Sagittal maxillary incisor sections from E12 (A-D), E13 (E-H), E14 (I-L), and E15 (M-P) mouse embryos. ICC/IF: F9 and NCCIT cells; Mouse neuromesodermal progenitors. 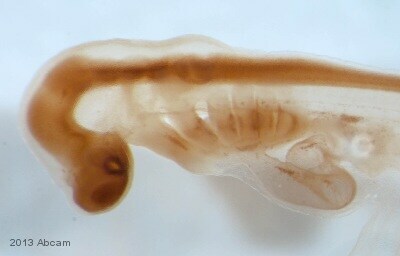 IHC-Wm: Leucoraja erinacea embryo; mouse blastocyst. Our Abpromise guarantee covers the use of ab92494 in the following tested applications. WB 1/1000 - 1/2000. 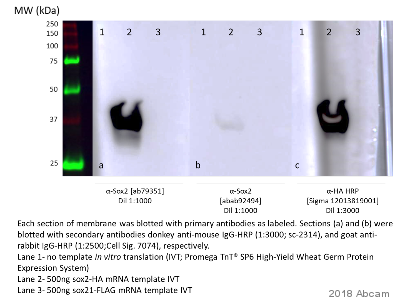 Detects a band of approximately 35 kDa (predicted molecular weight: 34 kDa). Sandwich ELISA Use a concentration of 0.5 µg/ml. For sandwich ELISA, use this antibody as Detection at 0.5 µg/ml with Rabbit monoclonal [EPR3131] to SOX2 (ab92494) as Capture. For unpurified use at 1/60. Immunocytochemistry/ Immunofluorescence - Anti-SOX2 antibody [EPR3131] (ab92494)Image from Gouti M et al., PLoS Biol. 2014;12(8):e1001937. Fig 2.; doi: 10.1371/journal.pbio.1001937. 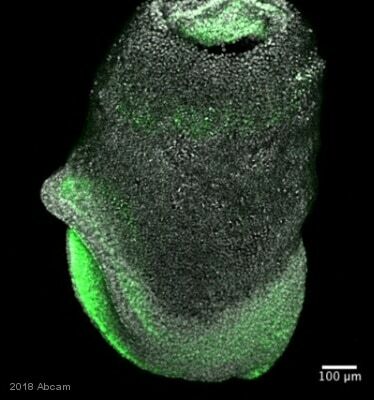 Transient Wnt and FGF signalling induce dual fated mouse neuromesodermal progenitors. Immunostaining of cells treated with FGF/Wnt revealed the coexpression of Brachyury with Sox2 (NMPs). In the absence of Wnt, NPCs express Sox2 but the expression of Brachyury is only evident in a very small proportion of cells. Immunohistochemistry (Formalin/PFA-fixed paraffin-embedded sections) - Anti-SOX2 antibody [EPR3131] (ab92494)Image from Togo Y et al., PLoS One. 2016;11(8):e0161067. Fig 6.; doi: 10.1371/journal.pone.0161067. SOX2 immunostaining in sagittal maxillary incisor sections from E12 (A-D), E13 (E-H), E14 (I-L), and E15 (M-P) embryos. At E13, strong SOX2 staining was seen in the lingual region of the epithelial dental lamina in all mice (E, G & H) except for the Usag-1+/+/Runx2-/- mice, in which SOX2 was found throughout the dental lamina (F). At E15, strong SOX2 staining was seen in the additional lingual bud in the Usag-1+/+/Runx2-/- mice (N). Ab92494 staining SOX2 in the F9 (mouse embryonal carcinoma) cell line by ICC/IF (Immunocytochemistry/immunofluorescence). Cells were fixed with 4% PFA, permeabilized with 0.1% Triton-X. Samples were incubated with primary antibody (1/200). An Alexa Fluor® 488-conjugated Goat anti-Rabbit IgG, Ab150077 (1/1000) was used as the secondary antibody. Counterstained with Ab7291 anti-Tubulin (1/1000), Ab150120 AlexaFluor®594 Goat anti-Mouse secondary (1/1000). DAPI was used as a nuclear counter stain. Negative control 1 Ab92494 was used as the primary antibody at 1/200 and Ab150120 was used as the secondary at 1/1000. Negative control 2 Ab7291was used as the primary antibody at 1/1000 and Ab150077 was used as the secondary at 1/1000. 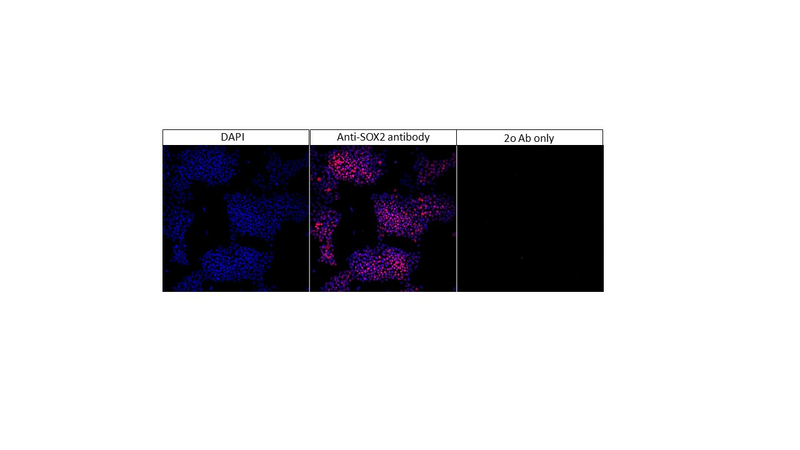 Ab92494 staining SOX2 in NCCIT cells by ICC/IF (Immunocytochemistry/immunofluorescence). Cells were fixed with 4% PFA, permeabilized with 0.1% Triton-X. Samples were incubated with primary antibody (1/200). An Alexa Fluor® 488-conjugated Goat anti-Rabbit IgG, Ab150077 (1/1000) was used as the secondary antibody. Counterstained with Ab7291 anti-Tubulin (1/1000), Ab150120 AlexaFluor®594 Goat anti-Mouse secondary (1/1000). DAPI was used as a nuclear counter stain. Confocal image showing negative staining on NIH/3T3 cells. Ab92494 staining SOX2 in the NIH/3T3 (mouse embryonic fibroblast cell line) (negative control) cell line by ICC/IF (Immunocytochemistry/immunofluorescence). 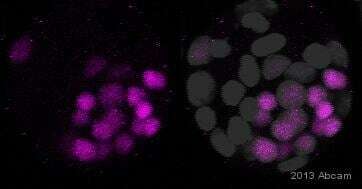 Cells were fixed with 4% PFA, permeabilized with 0.1% Triton-X. Samples were incubated with primary antibody (1/200). 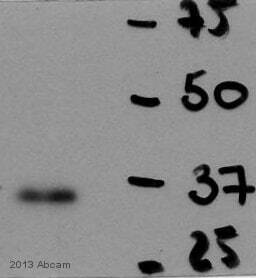 An Alexa Fluor® 488-conjugated Goat anti-Rabbit IgG, ab150077 (1/1000) was used as the secondary antibody. 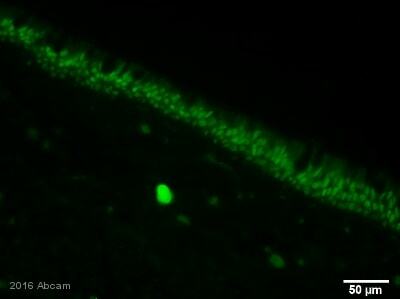 Counterstained with ab7291 anti-Tubulin (1/1000), Ab150120 Alexa Fluor® 594 Goat anti-Mouse secondary (1/1000). DAPI was used as a nuclear counter stain. Negative control 1: ab92494 was used as the primary antibody at 1/200 and ab150120 was used as the secondary at 1/1000. Negative control 2: ab7291was used as the primary antibody at 1/1000 and ab150077 was used as the secondary at 1/1000. Immunohistochemistry (Formalin/PFA-fixed paraffin-embedded sections) analysis of human gliocytoma tissue labelling SOX2 with unpurified ab92494 at 1/60. Heat mediated antigen retrieval was performed using Tris/EDTA buffer pH 9. A prediluted HRP-polymer conjugated anti-rabbit IgG was used as the secondary antibody. Counterstained with Hematoxylin. Immunohistochemistry (Formalin/PFA-fixed paraffin-embedded sections) analysis of human gliocytoma tissue labelling SOX2 with purified ab92494 at 1/100. Heat mediated antigen retrieval was performed using Tris/EDTA buffer pH 9. A prediluted HRP-polymer conjugated anti-rabbit IgG was used as the secondary antibody. Counterstained with Hematoxylin. Immunohistochemistry (Formalin/PFA-fixed paraffin-embedded sections) analysis of human breast carcinoma tissue labelling SOX2 with unpurified ab92494. Immunohistochemistry (Formalin/PFA-fixed paraffin-embedded sections) analysis of human fetal stomach tissue labelling SOX2 with unpurified ab92494. Immunohistochemistry (Formalin/PFA-fixed paraffin-embedded sections) analysis of human fetal lung tissue labelling SOX2 with unpurified ab92494. Immunohistochemistry (Formalin/PFA-fixed paraffin-embedded sections) analysis of human embryonal carcinoma tissue labelling SOX2 with unpurified ab92494. 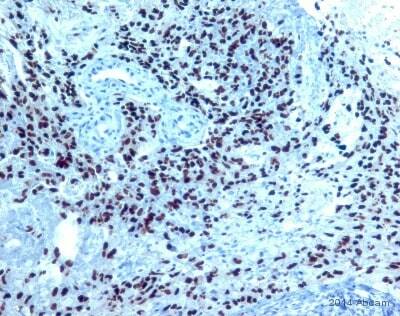 Immunohistochemistry (Formalin/PFA-fixed parffin-embedded sections) analysis of normal human lung tissue. Unpurified ab92494 shows negative staining. Negative control: Immunohistochemistry (Formalin/PFA-fixed paraffin-embedded sections) analysis of negative human seminoma tissue using unpurified ab92494. IHC - Wholemount - Anti-SOX2 antibody [EPR3131] (ab92494)Image courtesy of Dr. Gillis, Dalhousie University, Canada. IHC - Wholemount analysis of Leucoraja erinacea embryo labelling SOX2 with unpurified ab92494 at 1/200. The sample was incubated with the primary antibody for 48 hours at 4°C in 10% fetal calf serum in PBT. Detection: DAB. 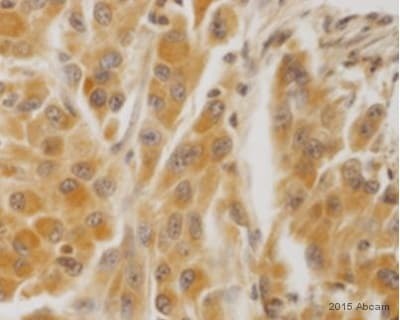 IHC - Wholemount - Anti-SOX2 antibody [EPR3131] (ab92494)This image is courtesy of an anonymous Abreview. IHC - Wholemount analysis of mouse blastocyst labelling SOX2 (pink) with unpurified ab92494 at 1/200. The sample was incubated with the primary antibody for 48 hours at 4°C. Nuclei stained with DAPI (grey). Standard Curve for SOX2 (Analyte: SOX2 protein (Human) (ab79950)); dilution range 1pg/ml to 1µg/ml using Capture Antibody Mouse monoclonal [57CT23.3.4] to SOX2 (ab75485) at 0.2µg/ml and Detector Antibody Rabbit monoclonal [EPR3131] to SOX2 (ab92494) at 0.5µg/ml.